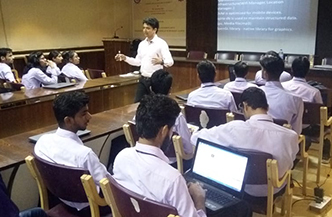 The Rajasthan Institute of Engineering & Technology organized a seminar on ANDROID APPLICATION DEVELOPMENT, on 15th September 2018. The main speaker on this occasion was Mr Amardeep Vijay, Senior software engineer, value first digital media Pvt Ltd, Gurugram. Mr Amardeep Vijay was welcomed by , Dr Saroj Hiranwal, Principal RIET, Dean Academics & Admin, RIET, Prof. Kapil Dev Sharma and Dr Sachin Sharma, Vice Principal, RIET. The session was attended by all HODs, students and faculty members of RIET. Android software development is the process by which new applications are created for devices running the Android operating system. Android apps are built as a combination of components that can be invoked individually. For example, an activity is a type of app component that provides a user interface. Android allows you to provide different resources for different devices. For example, you can create different layouts for different screen sizes. 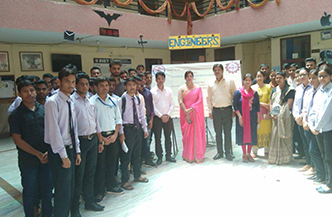 Dr Saroj Hiranwal, Principal RIET, said that the workshops of this kind help students to be aware of various applications available in android. This is helpful for faculty members also as they come to know about latest developments. Dean Academics & Admin, RIET, Prof. Kapil Dev Sharma said that Android has effectively become the world’s most popular operating system by a number of measures. This is very useful for all software engineers. 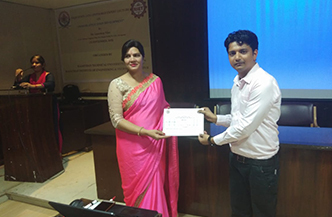 Prof Sachin Sharma, Vice Principal, RIET, expressed his gratitude to Mr Amardeep Vijay for giving his valuable time and imparting this knowledge. He also added that expert lectures of this kind helps the students and faculty members to remain updated in this field.